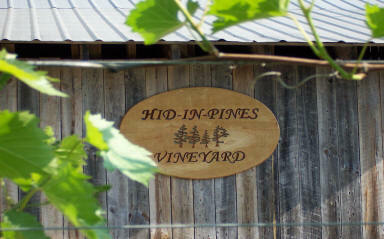 Welcome to the website for Hid-In-Pines Vineyard which is located in the Champlain Valley of New York and consists of seven acres of Cold Hardy grapevines able to withstand cold winters. From it's humble beginnings it is in an ever evolving state and recently expanded it's tasting room serving up it's delicious offerings such as the Petite Amie featured to the right. 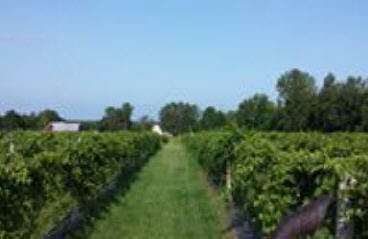 Feel free to look around the site which is still under construction, just like the winery. Ensuring a dependable yield of wine grapes, we grow a variety of Cold Hardy Wine Grapes, developed for the colder harsh environments here in northern NY. These varieties were developed by Elmer Swenson and The Unniversity of Minnesota. They shrug off cold temperatures and snows so that we might bring you great tasting wines from our own Estate Grown Grapes. See the Grape Variety page for more information. 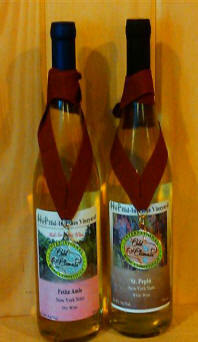 Some examples of the varieties are Marquette, Frontenac, St. Croix, LaCrescent, St. Pepin and LaCrosse.